I have already done my full Table top Review for the Umarex Beretta Mod. 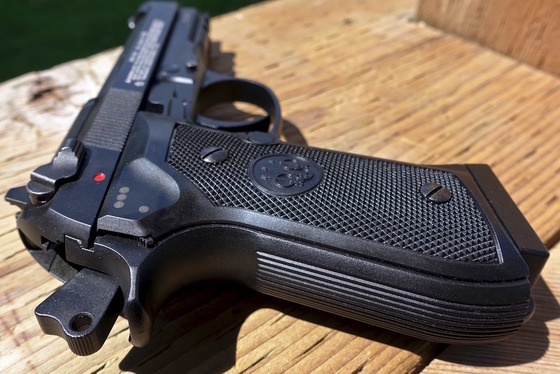 92 A1 CO2 Blowback 4.5mm BB Pistol so make sure to check that review out for more details on specifications and features. In this Field Test Shooting video I take out my Umarex Beretta Mod. 92 A1 CO2 Blowback 4.5mm BB Pistol and place five shots through my Chrony Chronograph to find out what the real word velocity performance will be and I also test the accuracy of the Umarex Beretta Mod. 92 A1 CO2 Blowback 4.5mm BB Pistol by shooting ten rounds down range at a paper target from 30 feet back using a semi rested shooting position(Gun rested on a sandbag, standing in the back). I also include some slow motion video of the Umarex Beretta Mod. 92 A1 blowback action close up in both semi auto and full auto modes. For the Feet Per Second portion of my test I used a brand new CO2 along with 5.1 grain RWS nickel coated 4.5mm Steel BB's. The temperature outside was 15 degrees Celsius (59 Fahrenheit), so not super warm or cold, I would expect a little higher fps on a warmed day. Umarex claims a velocity of 310 fps, I was able to get a five shot average of 322 which was nice to see a higher than claimed fps for the Umarex Beretta Mod. 92 A1 CO2 Blowback 4.5mm BB Pistol. Moving on to the Accuracy portion of my Field Test, I was able to get all 10 shots within a 2 inch grouping, not bad for a heavy blowback BB pistol. I did notice the shots where a little low and to the right so some shot placement adjustments may be required depending on your shooting range since the sights on the Umarex Beretta Mod. 92 A1 CO2 Blowback 4.5mm BB Pistol are non-adjustable. 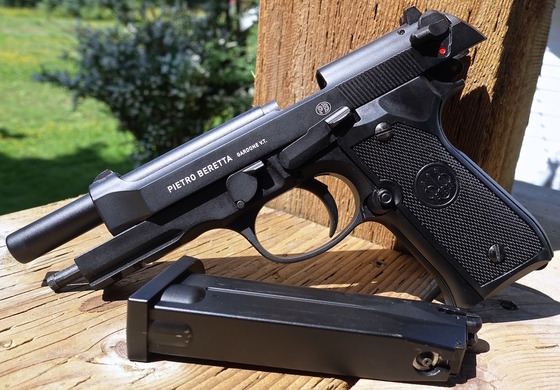 The blowback action is nice and strong and the trigger is also very typical to what you would find on a Beretta M92. Shooting in full auto mode is a lot of fun and really gets your hand rocking. You should be able to get around 4 magazines in semi auto shooting mode and closer to 3 magazine in full auto shooting mode.